Finally, we must talk about medium or media. In the beginning, God’s sole medium was the Spirit. Through Him, He gave life to humans and spoke to them even after the Fall through prophets whom He inspired. No effect; the Flood came anyway. Then Moses came along as the visible medium for a chosen nation. No effect; that nation became divided, exiled and scattered. Christ became the next visible and palpable medium of God after that, speaking God’s Truth in flesh and blood. Still no effect; they killed Him. Finally, Christ gave the Holy Spirit as the Ultimate Medium after He had resurrected and ascended. God’s intended effect is that now Christ, as King and Lord, can rule directly through the Holy Spirit over the individual, not over any institution, sect, association or nation. When a person lives or serves God according to the power of the Spirit, guiding and enabling to make God alive and working in that person’s life — not through artificial acts, such as religious ceremonies, sacraments, services or rituals but through “pure and undefiled religion” and “unstained living” — that person worships “in spirit and truth”. Always and completely — nothing more to add or subtract in terms of acceptability. The heart does it; the Spirit confirms it to God. The present material temple of God, which is the physical body of every believer, is meant to be organic, natural and fluid. It is not, as many believe, organized, artificial and rigid. Each person is responsible for whatever happens in that temple – hence, the rationale and motivation for individual reward or judgment. When Jesus, therefore, transferred the temple from Jerusalem to that living, personal temple, He gave the only solid and valid foundation of and for what “worship in spirit and truth” really is all about. We will never comprehend it within the present myopic and self-serving context of Organized Religion. Just as Jesus exhibited through His life a “walking temple” in all its glory and perfection, each believer must do the same wherever and whenever that may be. If you cannot “walk a temple” (literally) but have to walk to one to worship or serve God, you have completely missed the genuine Gospel message. You have no connection to God whatsoever! As the wind blows freely and surely, the spirit goes where it also wills. Have we ever looked at faith and worship in Jesus in this manner? If not, you do not know genuine freedom! What you know and practice is human-invented religion, at best, or slavery, at worst. Feeling holy or blessed in one’s Sunday-best is not true worship. It is not an emotion arising from one’s environment. Looking pious, prim and proper during church services, singing hymns and praises with gusto, jumping in jubilation and making joyful noise do not constitute “worship in spirit and truth” in the eyes of God. It may, in the eyes of humans, especially those who see themselves doing it according to their conventional or socially-accepted or religiously-approved formulas – both the leader and the follower. To God, we could be like the Israelites whose offerings were abominable because their hearts were far from Him. We become holy not by what we do or say to God but by what God has done and said to us. Aside from being patently-materialistic, unnecessary and extraneous, the organization can mask or hide sin, hypocrisy and corruption because of its inherently human structure, sheer size and its many clever mechanisms devised by devious minds to emphasize public appearances while hiding the dark motives of men and women propelled by pride, lust, greed, selfish ambition and acclaim. Review the curses of Jesus against the Pharisees and see how the same qualities are alive and active among many religious leaders today. Or maybe not so obvious – for many have become so proficient at masking their real character that majority of followers remain unaware, clueless and gullible. Sheepskin comes cheap and easy nowadays, especially through Lazada. Not all who say “Lord, Lord” will be justified – for many do it all for show or compliance according to strict, regimented patterns for social convenience. But “worship in spirit and truth” inside caves or catacombs or prisons or in the confines of one’s home or family (where it is most needed and best nurtured) is something that can never be programmed or faked. Organized is definitely not and will never be organic. The reason the apostles warned against those who will “lord it over” the believers is because organization allows — no, it intends — to make the majority become subject to a few lords or one supreme lord – Satan wants nothing less. The very act of registering a religion or group through an agency of the State already compromises a person’s allegiance to God. Why? Because every member will now be subject to policies and controls the State may have established in matters of settling issues, conflicts and disputes pertaining to management or ownership of money, properties and other assets, aside from allowing it to intrude into sensitive concerns, such as interpersonal relationships, through judicial settlements. (I Cor. 6: 1-7) This may not be such a big problem in cases where the ecclesiastical authorities have clout (they are a law unto themselves, anyway); but can be a source of abuse by the State where Religion has no power to wield, such as in communist countries. Either way, individual freedom is sacrificed in favor of the vaunted objectives of pursuing social order or legal legitimacy, things which believers must never depend on any human structure or authority to provide or impose. The Holy Spirit is sufficient for each believer to achieve inner discipline and confidence in the eyes of God. (II Cor. 3:1-6) Looking for it somewhere else is compromising one’s integrity in the Lord. The Lord is a jealous God. And He is, for a very good reason – not in a selfish, human way. Today, so many have taken His name and position and have deceived millions who follow false guides blindly into perdition. Organization, primarily, brings wealth and power. What Religion that does not have both can hope to survive? Not by might nor power, but by My spirit, says the Lord. (Zech. 4:6) By the power of the Spirit, the Kingdom grew and spread in the midst of great persecution and suffering. Today, Organized Religion rules among the kingdoms of this world by might and power, yet is so devoid of the Spirit of truth, unity, peace, purity, obedience and brotherly/sisterly compassion. Ironic and shameful as it is, the hierarchy lives in luxury while the masses languish. Remember, they will never give up their might and power. Only the True King and Lord can wrest those things away from them, whether individually or as a whole in His good time. Christ came to make the human being whole again – not torn apart by human rules and allegiances. When He served judgment on the churches of Asia, He called out those who were spreading the teachings of Satan. Yes, right in the midst of their assemblies, false and wicked teachers mingled and worked their deceitful schemes. John’s role was to write to those people, delivering the Spirit’s message. The Ultimate Medium was in them, among them and around them. He or she who would overcome will receive a personal reward – such as a secret name or a crown. The call was individual and the reward was also individual. Hence, in the midst of the State, Religion and Business, the Medium of Christ is hard at work spreading the Good News of the Kingdom. Whether you are a leader, a follower or a rebel, the Divine Medium speaks God’s Truth to you. In one form or another, the Gospel of Christ has been preached and heard by many in these islands and the rest of the world that, in essence, only a few have any valid excuse to claim “ignorance of the law” of the Spirit of God. No matter — the law of the conscience still applies. An atheistic lawyer who succeeds in exonerating a guilty criminal in front of a judge in court will not escape God’s judgment in the heavenly courts. The various media outlets and the Internet abound with news, photos, memes, videos, chat-rooms, interviews and articles about Christ and His messages through His followers. Knowledge has indeed increased and our access to information has also allowed us to redefine and refine our understanding of what we learned early on in school in their very elementary stages. Whether it is science, history, finance or learning how to cook the perfect steak, it is now a cinch. Facebook feeds you info galore. Just Google it! Even YouTube has it. How about going to Heaven? Living for eternity? Or entering the Kingdom of God? Living an abundant life? Or having a happy, fulfilling career or life? Yes, even all that is free and available online, so that practically no one has any excuse not to know the Gospel — in one form or another. Likewise, all these are within the benevolent scope of functions of our democratic State, our diverse Christian Religions and our gregarious Businesses. At least, that is how it was ideally in the Old Testament when God was tutoring Israel in proper nationhood and chosenhood as a prime showcase for the whole world. It was a failed experiment by humans – not for God. The three got ripped apart from each other and became ruled by wicked rulers and, since then, have plagued humanity. God brought out Jesus Christ from that small nation and succeeded in establishing His Kingdom. The rest is His Story. Through His Kingdom, Christ desires to rule over the kingdoms of this world through His followers who comprise this spiritual body in this world – in this world, but not of this world. When Satan offered all those kingdoms to Christ, He refused and rebuked Satan; for He was to be worshiped instead and not Satan. 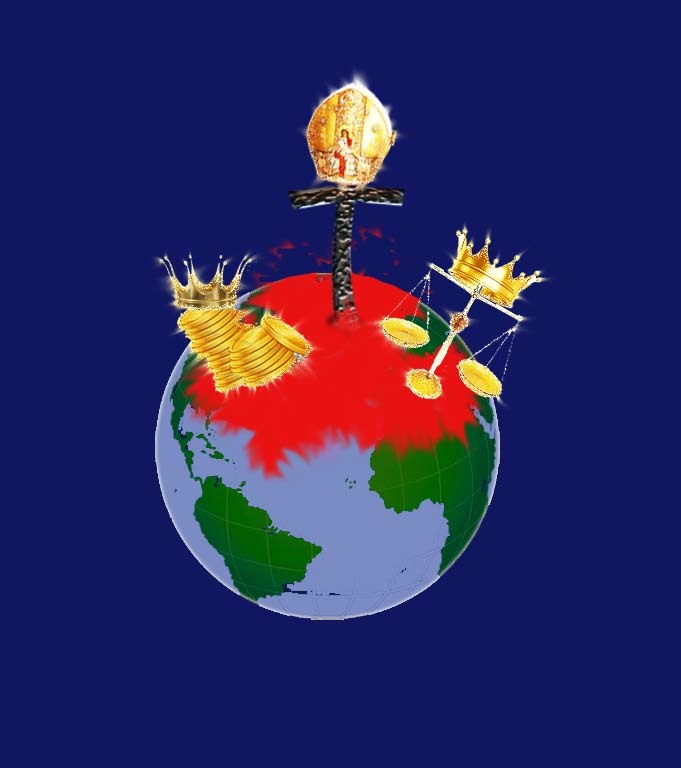 The entire present history of humans is the continuing process of God claiming rulership over all the kingdoms of this world through Christ and His followers. The nations are angry because of this as they have been dispossessed of their power and position. They continue to resist the righteous claim of Christ upon this world He had created. Everywhere you go, many deny His rule and sovereignty. They are literally possessed by Satan’s overarching character to regain and retain might and power. But who can resist the King of kings and the Lord of lords? If He rules over kings and is above all lordships, who is not under Him? Everything we do and everything that happens in this world hinges upon how we live our lives as His direct subjects (not serfs of Satan’s slave-masters wearing pointed hats and wielding golden staffs) and how things were made and controlled by His power for our own benefit (not just for the economic growth of any State, Religion or Business). Yes, even the animals and plants obey His laws. The planets and the stars as well. The formal declaration of this Truth had already been made two thousand years ago. Only the actual presentation and the awarding of those who serve Him faithfully remain to be done. This vision of John where people acknowledge Him as King over all kingdoms should not still be taken as a future event set in the chronological sequence of events written by a prophet of what many think will all occur only in Heaven. As we said, angels dart to and fro from place to place and from present to future. Interpreting these things as if they were fixed schedules on an airport departure terminal messes up our minds. Is Christ King now or not? Is He Lord or not? Does He reign in Heaven or not? Is He waging a war against Satan or not? Are you His soldier or not? Are you fighting for Him or fighting God instead? Are you in His Kingdom or are you still in one of this world’s kingdoms waiting to be rescued or recruited to Christ’s glorious Army? Or are you a warrior of a kingdom in this world who refuses to acknowledge the fact that you are, in reality, defending that kingdom and not allowing His Kingdom to overrun it? Or do you pride yourself as a warrior of God and yet involve yourself with the false, corrupt or compromising ways of a worldly kingdom (state, religion or business) you now serve? Nevertheless, just as Satan infiltrated God’s Creation and led it to destruction, Christ infiltrates this world’s kingdoms in order to destroy Satan’s works. Give reason for these worldly rulers to get angry at God by declaring His Truth and exposing their sins. The State, Religion and Business – empowered by the beast that sits as god in this world — stand in judgment before the King and Lord in Heaven. Do we really have to wait for an actual “Final Judgment” when the war now rages and the score cards show the ongoing fight between victors and losers? Judgment within the household of God had already begun during the time of the apostles, preparing the body of Christ and cleansing it for His return – and are we still shouting “Thou shall not judge!”? (I Pet. 4:17) Or do we, like Jesus, judge according to His truth? Do we reign and judge the world with Christ now through His Word or do we still wait for another go-signal from Him? Is it not already too late in the fight? Are we still debating what His Word says before we kick butts? The world is in a real mess, no doubt about it. It is no laughing matter. Before we get distracted by so much fun, food, frolic and entertainment, let us gear up our bodies and spirits for the war that calls us on. Time is running out. The cares of this world and the lusts of the eyes and of the flesh all beckon us to go see the world before the bucket goes – so, instead of butts, are we kicking buckets? And living mediocre lives? Yes, we travel far and wide to see how nations waged war and how they left ruins and relics of their glorious civilizations. Visit all the grand vistas of the world and what modern civilizations gained through their progress. Is our bucket so small we can fill it with so many such worldly sights and pleasures, when what awaits us is a mansion full of countless heavenly treasures beyond measure? Jesus never travelled far from Judea. When He saw the temple of Solomon, He thought of how every stone (or Jew?) will be scattered (makes you wonder what stones they might be wailing on in Jerusalem). When He thought of Solomon in his resplendent clothing, He could only tell people that Someone greater stood before them (yet modern would-be-Solomons cannot get enough of their gold-embroidered silk capes and golden crowns, though in God’s eyes they are truly naked). We want to see beauty, truth and glory in our lifetime? Read the Word and get to know Jesus Christ straight from the Holy Spirit. (I John 2:20-27) You might just be called to join a battle to win your own precious life. That is, if you are ready to take on the kingdoms of this world under His mighty and glorious banner.